Today Insomniac Games gave the world its first look at the new Ratchet and Clank for PS4. They've released a short trailer with gameplay footage from the Spring 2016 action platformer. Some of the footage in the trailer is from the CGI film, also due this Spring. 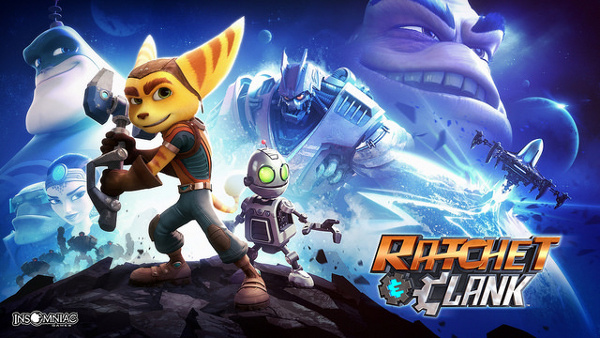 The movie tells the origin story of the cat-like alien Ratchet and his robot companion Clank. When Insomniac first set out to make this game, they were planning to "reimagine" the original Ratchet and Clank on 2002. They wanted to update that classic with some of the story seen in the upcoming film along with gameplay elements from later chapters in the series. However, Insomniac's James Stevenson said on PlayStation.Blog that the plans grew more ambitious over time. "We ended up with a new game, with elements based on the original — but now with modern controls, several new planets, new and updated gameplay segments, all-new Clank gameplay, all new boss fights, new flight sequences, and more… all constructed to take advantage of the graphical prowess of PS4. Throw in James Arnold Taylor as Ratchet, and you have a new beginning." One of the big changes in Ratchet and Clank PS4 is the arsenal. Most of the weapons are from other games in the series such as A Crack In Time's Groovitron, which causes enemies to dance. There are also some new additions. For example, the Pixelizer reduces enemies to 8-bit pixels. Insomniac is offering one more weapon as a pre-order bonus. Customers who reserve a copy will get access to The Bouncer from Ratchet and Clank: Going Commando. The Bouncer fires bombs that then releases smaller bouncing bombs that home in on enemies. Stevenson promises that we'll see more of Ratchet and Clank next week at E3. The game will actually be playable at the convention. I suspect Sony will feature R&C during their press conference as well.